Headstart Academy's volleyball camp for kids nine years old and up begins this March 30 and will end on May 25. 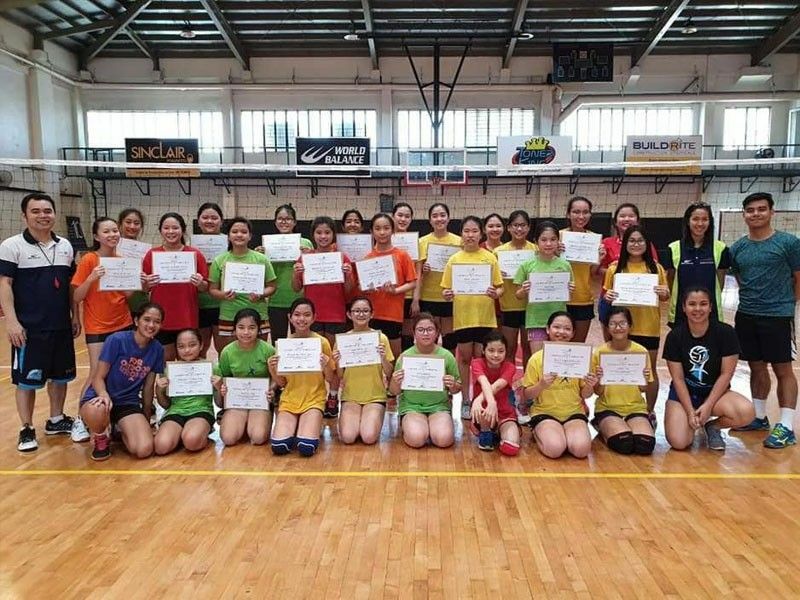 MANILA, Philippines – If you watch the high school basketball teams of Chiang Kai Shek College and Nazareth School of National University, there is one person who is always present and near the two teams’ head coach of Goldwyn Monteverde. That is Edster Sy, who not only helps sponsor Monteverde’s squads, but is also a coach in his own right. Sy competed in the volleyball and track and field teams of Grace Christian College during his school days and served as coach and basketball program head for various schools such as Jose Rizal University, Chiang Kai Shek College, Singapore School of Manila, Adamson University, and National University. However, it is with the company that he put up, Headstart Academy where he puts in a lot of his heart and soul. Headstart Academy is a grassroots sports development camp that focuses on basketball and volleyball. Headstart Academy, sponsored by World Balance for the last seven years, will open its camp doors once more to young kids on March 30 at the SGS Gym in Quezon City. The volleyball camp for kids nine years old and up begins on March 30 and will end on May 25. The basketball camp for kids from ages seven and up tips off on April 2 and finishes on April 30. The basketball camp is overseen by coaches who have played in the professional or collegiate ranks such as Boy De Vera, Elmer Latonio (former Letran Squires coach who handled players like Glenn Khobuntin and Kevin Alas), Elmer Bolabola (former PBA coach), Danny Ching, Eddie Laure (former Adamson star and long-time PBA player), Nicolo Chua, Jan Colina (former Adamson player and D-League star), Toffie Santos and Kenny Santos. Colina, who is currently serving in the Philippine Army, said Headstart Academy gave him his chance to coach and give back to the game. “Malaking bagay na makapagbigay sa sport kasi kung hindi dahil sa kanya ay baka hindi rin ako nakapag-aral. So ang coaching dito ay pagbibigay ulit sa laro at para ma-share ko yung natutunan ko sa mga bata,” he said. For those interested in joining the volleyball camp, contact coach Romela Quilop at 09053130805. For those interested in the basketball camp, contact Coach Willy Chan at 09178920120, 09224849560 and 02-4751190.